To start the week two excellent reasons why this new release of Peter Maxwell Davies' chamber music is good news. First, it's great music passionately played by the chamber ensemble Gemini and vividly recorded in the slightly dry acoustics of Studio 1 at the Department of Sound & Recording at the University of Surrey. (The department is very highly rated and has offered a tonmeister course for many years). The main work on the CD is Ave Maris Stella from 1975 which lasts for almost 30 minutes. This is classic early Max, writing before he was seduced by the plush sounds of the symphony orchestra and string quartet. Strange isn't it how composers like Maxwell Davies and Ralph Vaughan Williams produce some of their best works on religous themes yet are non-believers? 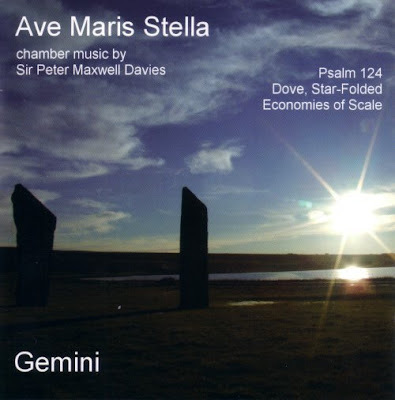 Worth the purchase price alone is Dove, Star Folded from 2001 which, unusually for Max, is based on a Greek Byzantine hymn; John Tavener had better look out. The second reason why this CD is good news is that it comes from the Metier label which has been aquired by the enterprising small Divine Art Record Company (who have nothing at all to do with Falun Gong ). Metier have a back catalogue well worth exploring, Michael Finnisy Music for String Quartet, Roberto Gerhard String Quartets and Morton Feldman and Christopher Fox's Clarinet and String Quartet are just some of the riches while Divine Art has a future release of piano sonatas from Elliott Carter, Miklos Rosza, Charles Ives and Edward MacDowell. And talking of Peter Maxwell Davies I'm playing his Missa Parvula on Future Radio on April 20 in a coupling with Edmund Rubbra's Symphony No. 6, which let's me give a heads-up to Dutton's excellent new recordings of Rubbra's chamber music. And it also means I can share some more good news. Future Radio's station manager told me today that the Overgrown Path programme page gets more hits than any other page on their website except for the schedule and webcam pages. That's more hits than the rock, hip-hop, electro and other programme pages. It must be all that Vaughan Williams I'm playing ... And more good news for the small guys/girls, leading independent record store Prelude Records in Norwich was packed on Saturday , the busiest I've ever seen. Is the tide turning away from the internet? It's good news week, which is why music is good for you..
Apostolic Studio (at 53 East 10th Street) was named after its tape machine, a prototype twelve-track Scully about six feet long. The rates were reasonable - $95 an hour and $115 an hour after midnight - because everyone had said that no one would go downtown to record. The studio had an in-house astrologer who sometimes decided that the signs were so bad that no recording should be done that day.